The No. 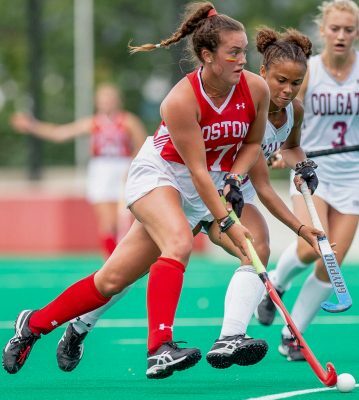 22 Boston University field hockey team scored its fourth conference win Saturday morning, after going double overtime and winning 3-2 at an away game against Bucknell University. After two consecutive losses against Ivy League opponents, No. 9 Harvard University and No. 3 Princeton University, the Terriers (8-5, 4-0 Patriot League) continue to lead an undefeated season in their own league after beating Bucknell (7-6, 2-2 Patriot League). BU head coach Sally Starr commended the team for its energy after the Ivy League losses. The Terriers pushed hard against the Bisons, outshooting them 15-7 and getting off seven corners. In the first half, BU scored the first goal when sophomore fullback Kathryn Scheerer fired a powerful shot from the inside arc, landing her first goal of the season. Bucknell was able to the tie the game with a goal from midfielder Claire Lesher, who also received her season’s first goal, assisted by forward Emily Doyle who crossed her the ball. The Terriers got back into the lead when sophomore forward Ailsa Connolly’s penalty corner found sophomore midfielder Maggie New, who crossed the ball to freshman midfielder Rebecca Janes. Janes was right in front of the goal and scored her second goal of the season. With the second half, the Bisons once again tied the game with another goal from Bucknell fullback Lexi Quick, who redirected a corner from Lesher into the net and brought her season’s goals up to six. In a particularly impressive defensive play, the second half saw Bucknell fullback Sam Chanzit hit the ball away from the goal inches before it was able to touch the net, ensuring BU wasn’t able to win before the game it went into overtime. Starr said she recognized Bucknell’s skill despite the Terrier victory, particularly that of Bison goalkeeper Olivia Harris. Harris was able to make seven saves against BU during the second half and the two overtime periods. Within the first two minutes of the second overtime, senior midfielder Allie Doggett found an opportunity when the Bison defenders left the circle, allowing Doggett to score on a breakaway after collecting her own rebound. Doggett’s goal won the long game for the Terriers and was her third of the season overall. The Terriers look to continue their winning streak against Lehigh University Saturday at noon.